A&M Energy Fires have been manufacturing Mesh Spark Curtains in the UK for over 30 years. 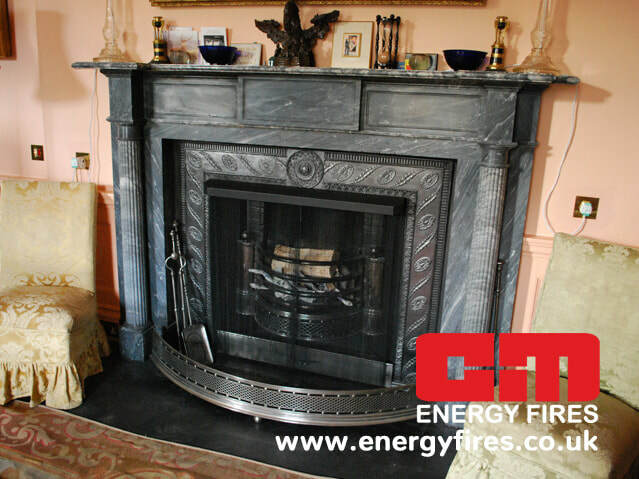 They are made-to-measure by hand and can be produced to fit any fireplace opening large or small, hood or canopy, inglenook or hole-in-the-wall. On larger fireplaces, they can be designed to park neatly out of sight down the inside walls. On smaller fireplaces we recommend a surface-mounted pelmet so that the curtains when drawn open do not obstruct the view of the fire. Our price includes for one and a half times the width of the opening in actual mesh supplied. We also provide a 75mm (3in) overlap in the centre. Our standard price includes the pelmet lintel bar, rail and fixings, although surface-mounted pelmets are extra. Mesh is available in black, stainless steel and brass. Delivery is normally 7-10 days. Some examples of our Spark Curtain work are shown below.